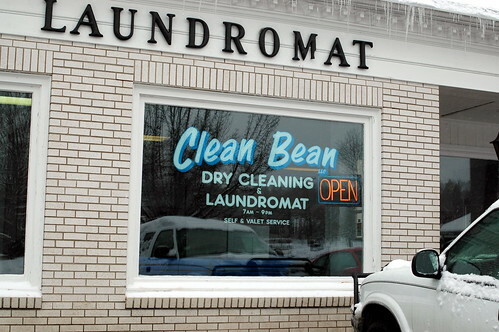 cleanbean, originally uploaded by jahansell. A young woman I know bought the laundromat last year as an investment opportunity. It's another fairly stable business, I guess! She renamed it, spruced it up inside, and it continues to be an important part of the plaza. I admire the entrepreneurial instinct. I have often wondered if I would enjoy running a business. Many of the skills I've developed over the years running a non-profit organization would apply, of course - but what kind of business should it be? And where on earth would I get the money it takes to purchase or lease the property, renovate and stock a store? I don't know how people do it - family money? investors? small business loans? The other thing I wonder about the new startup businesses I see is, how good do their projections and market research have to be to get someone to invest or lend them money? I've seen SO many businesses come and go in Millerton - little gift shops, antique shops, housewares shops - all variants of the same idea, which seems to be: "I love beautiful things. I'm good at picking them out, everyone says so. I'd love to have a store like this, and surely everyone else will love it too." Hopefully it's all a little more sophisticated than that, but considering how many shops open and close within a year, I wonder! Not the laundromat, though - that will always be around! Where do people get money to start a small business? Well; in the recent past (the last 15 years) many of those small businesses were started with money "taken out of their houses" via 2nd or 3rd mortgages. The classic "home equity loans" that you could get by using the value of your home as collateral; no need to submit a business plan or show any reliable source of income. I guess that's gonna stop real quick! In many of those cases; not only do the businesses fail...but the family loses their home as well. In my opinion (I admit that I'm old enough to have become super conservative and cautious...) A business should only be started with money that you can readily afford to lose. You hit the nail on the head -- both in terms of the method of financing and the risk involved. Starting a business (or buying an existing one) is like wagering or investing. And you know the old saying: "Never invest anything you can't afford to lose." I'd sure like to know, in response to Rick's comments on Terry's blog, what are the issues with P&Z, which he implies are the root of the problem. But of course I can't comment on Terry's blog. Maybe Rick can enlighten me here. The issue with local businesses, certainy grocers, is price. You either have to have low prices (S&S, Big Y, Price Chopper, etc.) or premium products (La Bonne's) to survive. Trotta's was stuck in the middle. It is the same issue we face with some kitchen remodeling. Local vendors can't compete in price (though we did use one for our floors). I'm not saying it's their fault or that it's fair that the big boxes can undercut them (it isn't). But we have to face realities, too.